I’m happy to let you know that we’re all part of a nationwide Cub Scouting improvement project led by the Boy Scouts of America. Starting in June, we’ll be going through the biggest changes to Cub Scouting since the 1960’s. The all-new program will make Cub Scouting more active, easier for parents to understand, and more fun for everyone. All-new rank handbooks that your son will want to read. A simpler advancement system: The complicated system of Progress Toward Rank Beads, Arrow Points and Academic & Athletic Belt Loops will be retired. 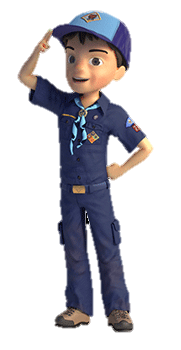 Earning a rank badge will now require your Cub Scout to earn 7 “adventure loops”. He’ll wear these on his (now required) blue Cub Scout Web Belt. Each adventure loop is different, and to earn one your son will likely participate in a few den meetings plus a den outing or pack meeting. Requirements may also be completed at camp. Faster recognition: Boys will be congratulated in their den meetings for completing adventure loop requirements, but they’ll receive the adventure loop itself at the next scheduled pack meeting. During each pack meeting, a few minutes will be devoted to recognizing all the boys' achievements in a brief special ceremony. Rank badges will be awarded at pack meetings too, rather than waiting for the Annual Blue & Gold Banquet. More den participation at pack meetings. Each den will take turns “hosting” pack meetings. It’ll be important for your son’s advancement to participate in these. Learning the same Scout Oath and Scout Law as the older Boy Scouts instead of the now retired Cub Scout Promise and Law of the Pack. There are other changes detailed in this Scouting Magazine post. Your pack and den leaders are ready. They’ve been trained and are familiar with the new program. They’ve worked towards creating next year’s calendar which will be finalized June 8. The significance of den meetings, pack meetings, and service projects will increase (all will be important for rank advancement). Activities such as Optional Pack Outings, Pinewood Derby, Blue & Gold Annual Banquet, and others will supplement the meetings and service projects. Going to camp will be important and we’re making signing up easier. Rather than filling out paper forms and writing checks you’ll use online camp registration and payment systems. We’re still keeping Pack 151’s website and it will be updated to include all our new changes, including adopting the BSA-owned Scoutbook.com. While rank handbooks will always be important, Scouts and parents will have fun reporting their advancement progress online, ensuring your son receives the recognition he deserves. Instead of our current email system, leaders will use Scoutbook to better communicate with families via email, texts, calendars, and RSVP requests. Look for your Scoutbook invitation coming soon! Pack 151’s leaders and I are looking forward to these changes. We welcome any questions you may have.